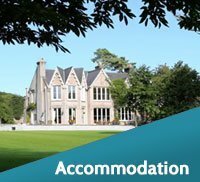 With around 20 to choose from, we have beaches to suit every mood and activity. 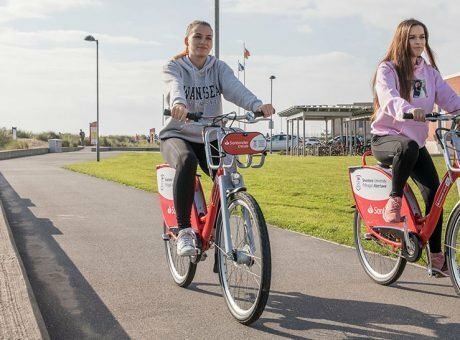 Whatever seaside experience floats your boat, we’ve a sandy superstar that fits the bill. 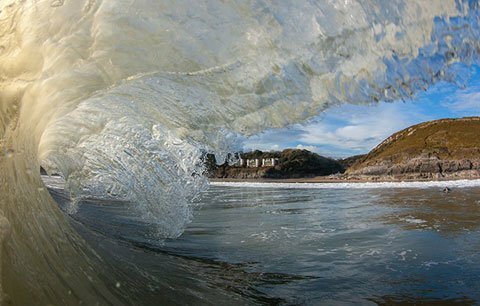 There are sheltered spots like lovely Langland Bay (complete with its dainty period beach huts), hidden gems such as remote Pwll Du, and bucket and spadefuls of family favourites including Port Eynon and Oxwich. Many of our spotless sands come laden with coastal awards. The daddy of them all is mighty Rhossili, a regular feature in charts of the world’s best beaches. Go on a seaside safari. 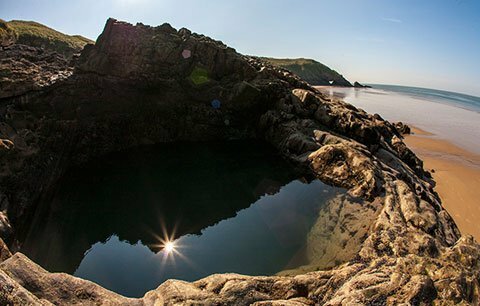 Little explorers can search for crabs, starfish, anemones and a host of other miniature marine creatures in the rockpools of Bracelet Bay and Limeslade Bay, both conveniently close to family-friendly Mumbles. Or think a little bigger with a splashy boat trip round Gower’s abundant shores. Our unspoilt coastline is a haven for wildlife on land and sea, from the guillemots, razorbills and puffins nesting on rocky cliffs to the seals, dolphins and porpoises that dart through the waves. Our sands aren’t reserved for sunbathers. 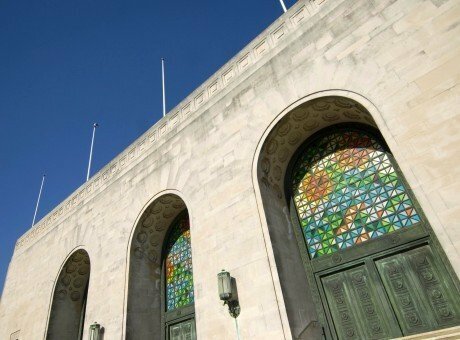 They’re also the perfect arena for all kinds of sports and games. 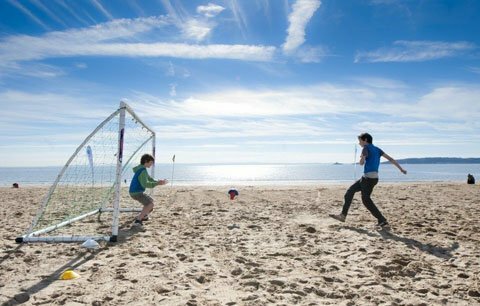 Rounders and beach volley are seaside staples, but there’s much more on offer at Swansea Bay’s 360 Beach and Watersports. 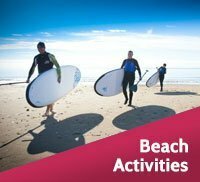 Active beachgoers can try their hand at everything from beach rugby and tennis to Ultimate Frisbee and sandy games of soccer. If you prefer your beach games a little speedier, try wild and windy kite-buggying and landboarding from Gower Kite Riders. Our shores have salty tales to tell. Shipwrecks dot the coast. 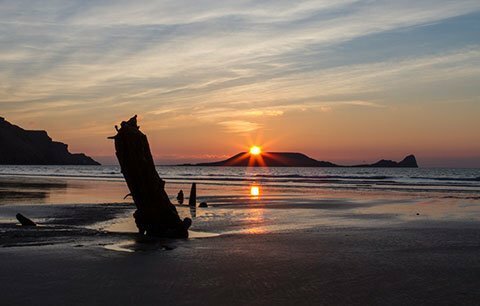 Many lie hidden beneath the waves, but the skeletal remains of the Helvetia – wrecked in 1887 – still poke hauntingly from Rhossili’s sands. Smugglers once operated freely across Gower, landing contraband cargo in the peninsula’s secluded bays (no prizes for guessing how remote Brandy Cove got its name). You can still see remnants of this illicit trade, such as Port Eynon’s Salthouse, once a hub of the busy local smuggling industry. 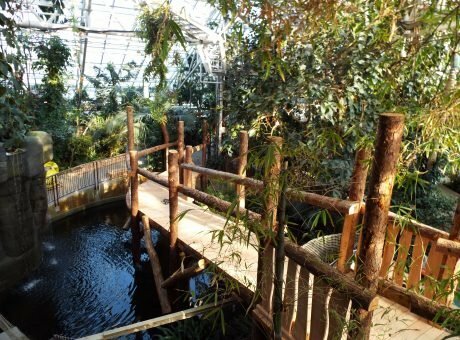 We’re big believers in caring for our environment. Maybe that’s why our beautiful bays hold a host of seaside accolades, including Seaside Awards and Blue Flags. 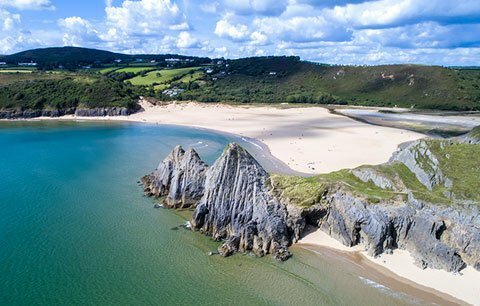 What’s more, a whopping three-quarters of Gower’s coast is protected by the National Trust, and the peninsula is home to eco-friendly businesses specialising in ‘green’ outdoor skills like bushcraft, woodcraft, foraging and wall-building. We work hard to keep our land and sands spotless and our seas sparkling so that visitors can continue to enjoy them in their pristine glory. Some things are worth looking after. We want everyone to enjoy our coast, including your four-legged family members. 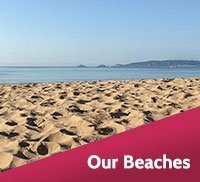 There are dog-friendly beaches all over Swansea Bay and Gower where furry visitors can get their paws wet. 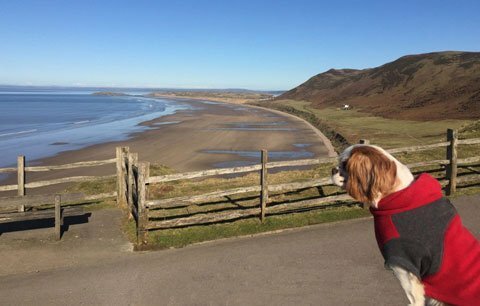 These include secluded spots like snug little Mewslade Bay, bustling family favourite Oxwich Bay and superstar Rhossili, which counts The Times’s award for the UK’s top dog-friendly beach among its lengthy list of accolades.